We are all familiar with the age-old proverb “no foot, no horse” and in the modern day this still stands. Alongside correct farriery, the quality of nutrition our horses receive has a huge impact on their hooves. A poor diet can lead to poor and slow growth rate, hoof cracks and even laminitis. Many people wait until a problem arises with their horse’s hooves – which often coincides with the summer months when ground is dry and hard and hooves become lacking in moisture. Problems can be cracks, lost shoes, bruised soles and general discomfort and all can lead to lack of performance during the season when you want to be out riding and competing the most! Nutrients take several months to make a difference to hoof health and encourage strong horn to grow so actually by the time these problems arise it is often too late! 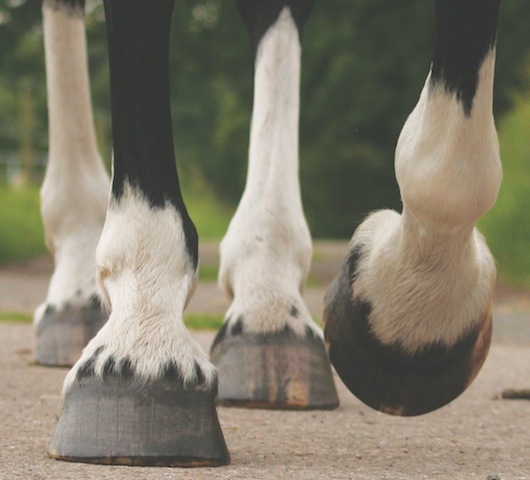 For this reason we suggest that you provide the correct vitamins, minerals and trace elements all year round to support healthy hooves. • Biotin is a well-known ingredient to aid hoof health and has shown to be a useful addition to help support the health of hooves in horses and ponies prone to laminitis. However Biotin alone is not enough to maintain hoof integrity. • Methionine is one of the major building blocks in the development of healthy connective tissue, along with Copper and Vitamin C.
• Chelated Zinc is said to be vital for the laying down of tough and strong Keratin. Keratin is the tough material found in the outer layers of the hoof and skin and if not formed properly can lead to soft and brittle hooves. • Oil is an essential fatty acid and is necessary to help support moisture maintenance and pliability of the hoof structure. • A balance of general vitamins and minerals will support the overall health and vitality of the horse, and in turn ensure that the body is able to utilise nutrients and maintain wellbeing and performance. Don’t forget to treat your horse as an individual and evaluate his requirements. An older horse may have difficulty chewing and therefore might not absorb the nutrients he requires to grow strong and healthy hooves from hard feed alone, so providing these nutrients in an easy to consume method, such as a lick may be beneficial. Likewise, a horse on restricted calories due to weight management still requires a balanced diet to support the immune system and aid general health. Feeding hard feed may not be an option here but by regulating access to a lick containing the optimum level of ingredients to support healthy hooves you can be sure that they are receiving what they need without the risk of piling on the pounds. Did you know that every single Horslyx product contains Biotin, Methionine and Zinc as part of the Healthy Hooves package? So if you aren’t already, act now and provide your horse with the building blocks for healthy and strong hooves this season!